Gooseberry bushes produce an edible fruit and are grown on both a commercial and domestic basis.Although usually placed as a subgenus within Ribes, a few taxonomists treat Grossularia as a separate genus, although hybrids between gooseberry and blackcurrant are possible. Gooseberries are edible and can be eaten as-is, or used as an ingredient in desserts, such as pies, fools and crumbles. Early pickings are generally sour and more appropriate for culinary use. They are also used to flavour beverages such as sodas, flavoured waters, or milk, and can be made into fruit wines and teas. Gooseberries can be preserved in the form of jams, dried fruit, or as the primary or a secondary ingredient in pickling, or stored in sugar syrup. 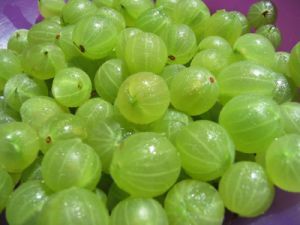 In the UK gooseberries were particularly popular before fruit was imported in quantity from elsewhere, as they constituted the first available fresh fruit of the year. A 1-cup serving of fresh, raw gooseberries contains 41.6 milligrams of vitamin C. This amount supplies 55 percent of the recommended daily allowance of vitamin C for an adult woman, and 46 percent of the RDA for a man. Vitamin C is an antioxidant that can prevent free radical compounds from damaging DNA and cellular tissue. It is also needed for collagen synthesis and to help maintain strong teeth and bones. A diet that includes plenty of vitamin C may lower your risk of hypertension, heart disease, cancer and osteoarthritis. To get the most vitamin C out of fresh gooseberries, store the fruit in a cool, dark place and use the berries within three to four days. Gooseberries contain 6.4 grams of dietary fiber in each cup of the fresh fruit, or about 26 percent of the amount of fiber that healthy adults should consume each day. Berries like gooseberries are a good source of both soluble and insoluble fiber. Soluble fiber intake is linked to a decreased risk of diabetes and high blood cholesterol, while insoluble fiber can regulate your bowel movements and may help prevent digestive problems like hemorrhoids and colon cancer. Adult women need 1.8 milligrams of manganese each day, while men require 2.3 milligrams to fulfill their daily requirement. Fresh gooseberries have 0.216 milligrams of manganese per cup, supplying 12 percent of the RDA for women and 9 percent for men. The body needs manganese to promote calcium absorption, to aid with energy metabolism and blood sugar regulation and to trigger the function of the antioxidant enzyme superoxide dismutase, or SOD. If your diet lacks adequate manganese, you may be more likely to develop diabetes, osteoporosis or arthritis. Each 1-cup serving of fresh gooseberries has 435 International Units of vitamin A, or 18 percent of a woman's daily vitamin A requirement and 14 percent of a man's. In gooseberries, vitamin A is in the carotenoid compound form. Carotenoids are antioxidants that may prevent heart disease, diabetes and neurodegenerative disorders like Alzheimer's disease. The vitamin A in gooseberries also contributes to eye health, helps regulate genes and stimulates red blood cell production. A diet high in vitamin A may lessen your risk of infections and eye problems like age-related macular degeneration. Recipe using Gooseberries see Here and Here.